Handcrafted in Crewe, England, by a team of highly skilled artisans, the Mulsanne is the flagship of the Bentley range and represents everything the British brand knows about building the world’s most powerful, most luxurious cars. For the first time, the Mulsanne family now comprises three distinct models, all with their own unique abilities and attributes. The Mulsanne, Mulsanne Speed and Mulsanne Extended Wheelbase all share Bentley’s unrivalled levels of attention to detail and craftsmanship, while at the same time catering for the needs of individual customers. 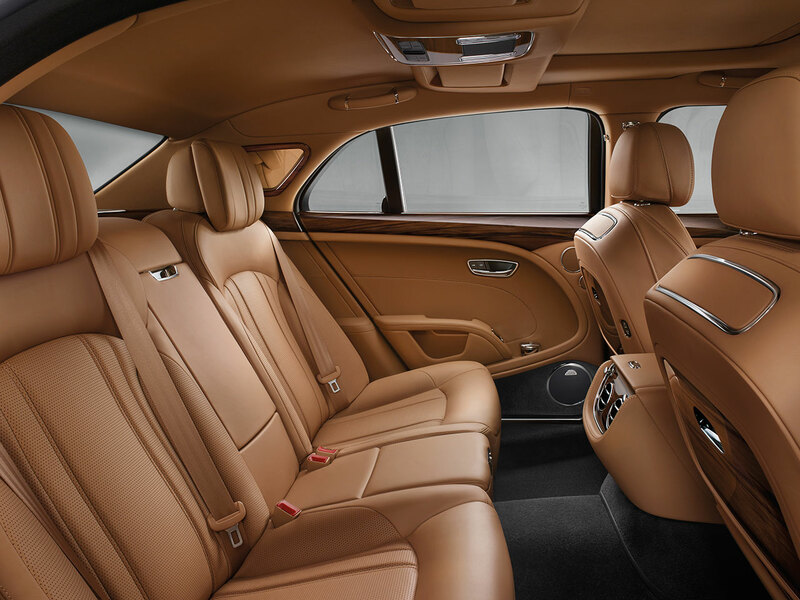 The new Mulsanne Extended Wheelbase, for example, has been designed with the rear-seat passenger in mind. An additional 250 mm of rear legroom, airline-style extending legrests and a rear compartment sunroof combine to create the most relaxing automotive environment in the world. The Mulsanne Speed, meanwhile, is tailored for the driver with 537 PS (530 bhp / 395 kW) and 1,100 Nm (811 lb.ft) of torque resulting in a 0-60 mph time of just 4.9 seconds and a top speed of 190 mph. 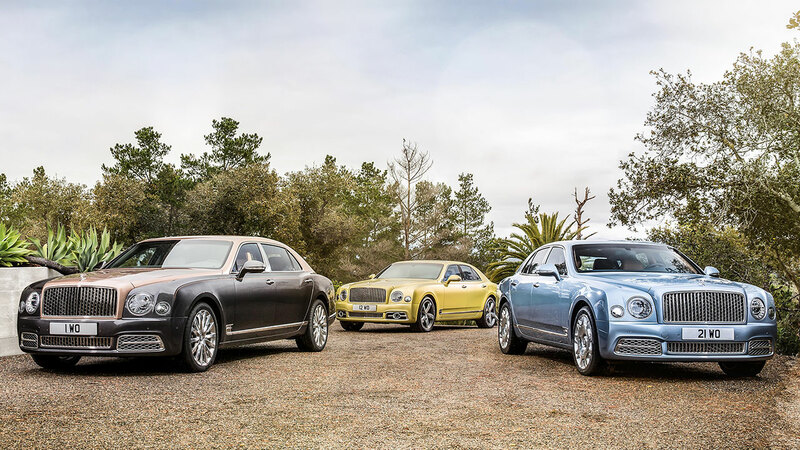 A suite of elegantly executed styling revisions mark the new Mulsanne out from its predecessor. The entire front-end style of the car (forward of the A pillar) has been completely redesigned. The fenders, bonnet, radiator shell, grilles, lights – and bumpers fore and aft – have all been updated, giving the car a more modern and integrated appearance. On the inside, occupants will of course find the world’s finest handcrafted wood, leather and metal fittings, and the new Mulsanne also boasts redesigned seats, new door trims and armrests, unique glass switchgear and an industry-leading palette of 24 exquisite hide colours. 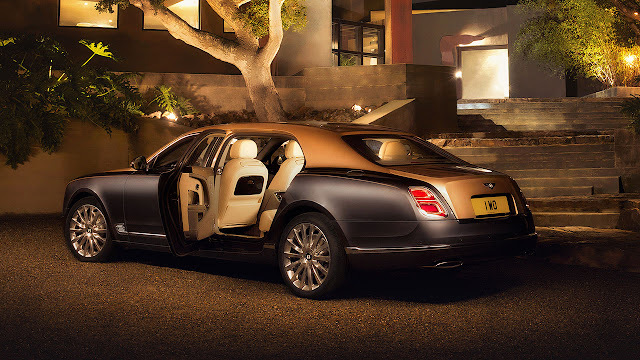 The new Mulsanne also features a suite of innovative, cutting-edge technologies. A new touchscreen infotainment system has been developed for the Mulsanne. Wolfgang Dürheimer, chairman and chief executive of Bentley Motors, comments: “The Mulsanne is the epitome of Bentley’s DNA – exquisite, individual and powerful. It defines luxury in the automotive world and offers a uniquely Bentley blend of luxury and performance. 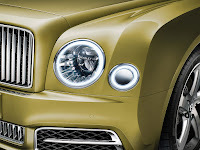 The new Mulsanne range will make its global debut at the Geneva Motor Show between 1 and 13 March 2016. First customer deliveries begin in the summer. The front of the new Bentley Mulsanne has been entirely redesigned, with the resultant look exuding a more modern, integrated air. The new, imposing front end is dominated by a large stainless steel vertical-vane grille, 80 mm wider than before, that celebrates the great models of the past, such as the 8 Litre of 1930, Embiricos and R-Type Continental. 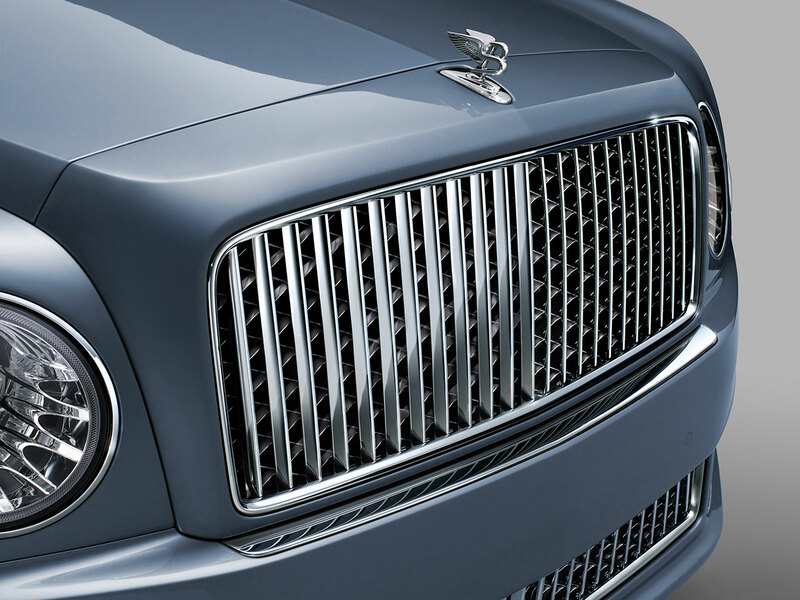 Through these vertical vanes the Bentley matrix grille is visible. Positioned either side of this are a pair of floating all-LED headlamps. These new units feature advanced adaptive technology and greatly increased night vision, with beam patterns that automatically adjust to suit the driving conditions. The LED lights sit flush within the seamless superformed aluminium front fenders. Innovative design features, like the discreet chrome-capped headlamp washers that sit within the adjacent outer lamps, demonstrate an ethos of precise execution of detail. 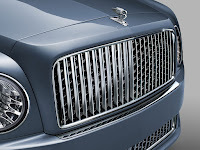 A new horizon line is also created across the front of the Mulsanne by raising the outer lamps so that their bases are in line with the main headlights. The new one-piece bumper, radiator shell and bonnet integrate seamlessly with flush joins creating more visual width and presence. These features flow down to a lower vane-grille section, which is in turn flanked by ‘B’ signature matrix elements – pushed further out to the corners by 53 mm either side – and finished in bright chrome. The brightware detailing continues on either side of the Mulsanne with a new B-shaped wing vent incorporated into the lower section of the fender. At the rear, this more planted appearance continues with new tail lights and a redesigned bumper. The bumper, which has 26 mm wider lower corners and a strong light-catching feature line, creates a more purposeful appearance. The new tail lamps incorporate a ‘B’ theme with light guides creating an instantly recognisable signature – particularly in the dark. On the inside, the Bentley Mulsanne’s reputation for offering the finest automotive interior in the world is further enhanced. It takes more than 150 hours to create the sumptuous soft-touch leather interior, which now features redesigned seats, armrests and door trims. The Mulsanne’s seats – the industry benchmark for comfort – are now available in two new styles: Fluted, or Quilted. Customers also have the choice of 24 hide colours and single or duo-tone finishes. Hand-selected veneers form pure and elegant surfaces throughout the cabin, and each of the 40 pieces are shaped by Bentley’s artisans from a choice of 13 different veneers, and finished with trademark attention to detail. Elsewhere in the cabin, bright-polished stainless steel, unique glass switchgear, traditional knurled controls and deep-pile carpets enhance the pinnacle luxury environment. A suite of innovative and advanced technologies have been added, ensuring that the new Mulsanne is as technologically advanced as it is luxurious. The new Mulsanne features a completely new infotainment system, boasting class-leading navigation technology. It also features a selection of on-board infotainment systems that raise the bar for audio and visual entertainment on the move. The core of the new system is an all-new touch-screen-based infotainment platform with additional haptic controls, classic analogue gauges and state-of-the-art rear-seat entertainment. The main 8” display touch screen is connected to a 60 GB solid-state hard drive for the storage of on-board media. High Beam Assist automatically switches between high beam and dipped headlights when oncoming vehicles are detected. The system also adapts the shape of the light beam according to vehicle speed in three separate modes – Town, Country and Motorway. Between 10 km/h and 250 km/h the Blind Spot Warning system detects vehicles behind the Mulsanne and in its blind spots, predicting the possibility of a collision. Visual warnings are issued to the driver via flashing lights in the door mirrors. For additional safety while on the move, the new Mulsanne comes with Advanced Automatic Stability Control (ASC) including collision mitigation features. The new Mulsanne can be specified with the world’s most powerful automotive OEM audio system – Naim for Bentley Premium Audio. This bespoke on-board audio system features 20 speakers, 20 channels, a 2,200 watt amplifier and Super Tweeters, for unrivalled re-creation of the highest audio frequencies. Rear-seat passengers benefit from the introduction of the Bentley Entertainment Tablet – a pair of 10.2” Android devices (with 4G, WiFi and Bluetooth) seamlessly integrated into the backs of the front seats. With typically exquisite attention to detail, a single touch of a button engages a beautifully weighted mechanism, smoothly deploying the screens from their stowed positions. 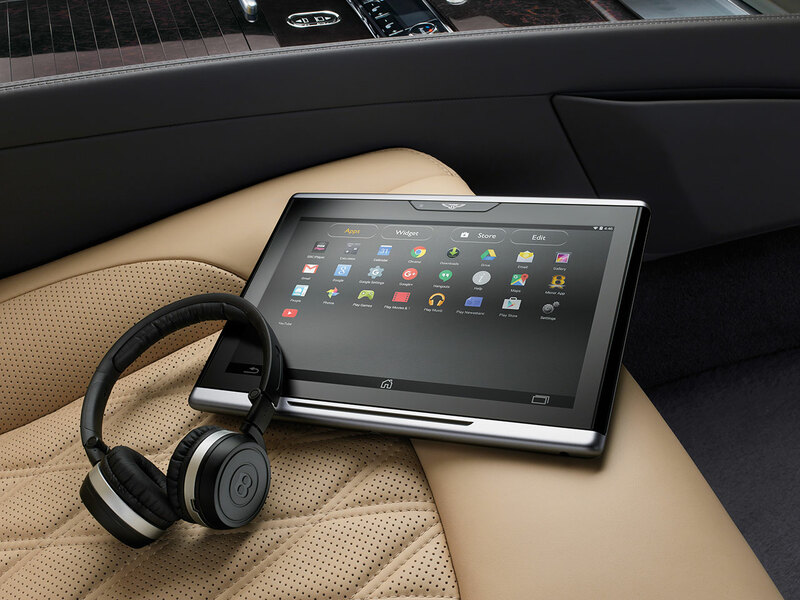 The Android-powered tablets, which feature a Bentley-specific interface, have access to over a million Android Apps – such as Skype, Google Play and Spotify – and can be used away from the car, in the office and at home. Each tablet has 32 GB of on-board storage (expandable to 128 GB via a Micro-SDXC card), USB ports and a front-facing camera. 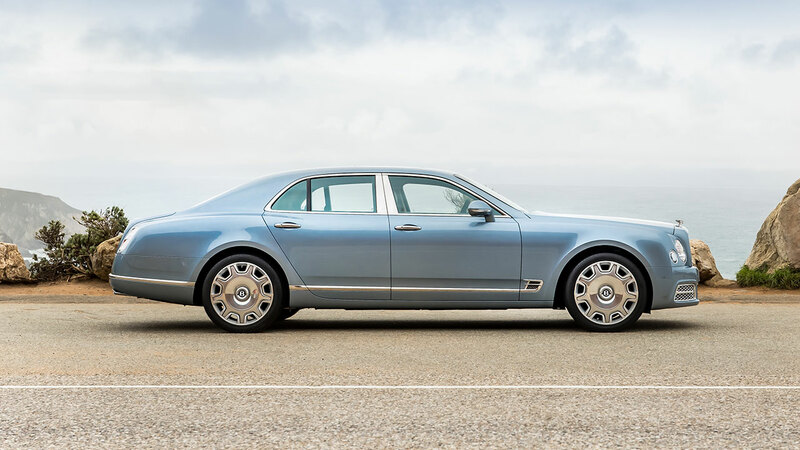 Audio can also be streamed through the vehicle speakers, and new destinations can be sent from the tablets to the Mulsanne’s navigation system. Internet browsing is via the car’s 4G WiFi system, permitting access to internet radio and local or streamed video. 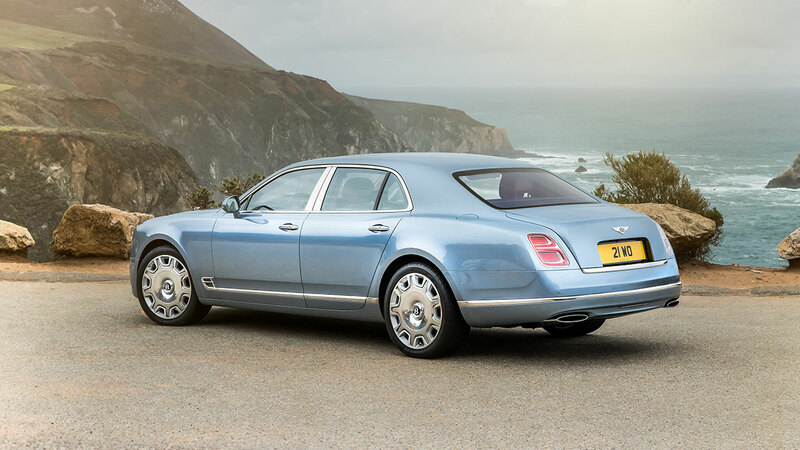 In the new Mulsanne, the mighty 6¾-litre V8 develops 512 PS (505 bhp / 377 kW) and 1,020 Nm (752 lb.ft) of torque. This immense power – channelled though an eight-speed ZF automatic transmission – is available from just above idle right across the rev range, ensuring that with even the slightest input the driver is immediately rewarded with phenomenal acceleration. The sprint to 60 mph is dispatched in just 5.1 seconds en route to a top speed of 184 mph (296 km/h). The Mulsanne’s V8 engine features key technologies such as cylinder de-activation and variable cam phasing, which reduce both fuel consumption (19.3 mpg / 14.6 L/100 km on the combined cycle) and CO2 emissions (342 g/km). The Mulsanne’s prodigious power and torque are complemented by all-new chassis hardware including active engine mounts and suspension bushes. To further enhance the trademark hushed ride, Bentley has integrated the latest noise absorption technology into the Mulsanne’s tyres. This advanced foam architecture reduces interior cabin noise by up to 4 dBA and provides an unmatched level of ride refinement. The Drive Dynamics Control system, operated by a rotary switch mounted next to the gearshift selector, can be used to choose from three standard modes – Bentley, Sport and Comfort – offering precise calibration of suspension and steering control systems.A fourth mode, Custom, allows the driver to select bespoke settings via the multimedia system to ‘tune’ the Mulsanne to a preferred driving style. The air suspension system with Continuous Damping Control (CDC) creates a refined and comfortable ride at lower speeds, and lowers the Mulsanne’s ride height automatically at high speeds to reduce lift and improve aerodynamic stability. With 20” alloy wheels and 265/45 ZR 20 tyres as standard, dynamic handling is assured. Customers may also opt for 21” wheels, available in three styles, fitted with 265/40 ZR 21 tyres. Designed for customers with a preference for being driven, the Bentley Mulsanne Extended Wheelbase offers a first-class air-travel experience for the road. The 250 mm extension of the Mulsanne’s wheelbase (from 3,266 mm up to 3,516 mm) is entirely to the benefit of rear-seat passenger legroom. This significant increase in interior space makes the Mulsanne Extended Wheelbase the most generously proportion pinnacle luxury limousine in the world, and by far the most comfortable way to travel on four wheels. To make the best use of the additional rear legroom, Bentley has developed airline-style electronic legrests which are integrated into the bases of the two rear seats. These extend outward and pivot, affording rear-seat passengers the luxury of choice between upright, relaxed and reclined seating positions. A beautifully appointed console separates the two rear seats in the Mulsanne Extended Wheelbase. Ornate and functional, the console is appointed in the finest handcrafted veneer, metal, glass and leather and houses practical features such as USB ports, pen holders, cup holders and a glass-covered stowage area. For those passengers who wish to work on the move, both rear seats can also be specified with a deployable, folding table. For privacy, electric curtains at the rear are standard fitment and can be tailored with either a black or champagne coloured interior lining. Rear-seat passengers also benefit from a large-format sunroof over the rear cabin. Controlled by the passengers or the driver, the tilting and sliding glass panel (with Alcantara sun blind) allows natural light to flood into the Mulsanne’s beautifully appointed cabin and clearly reinforces the Extended Wheelbase’s focus on the rearward passenger. For additional differentiation and choice, customers are able to specify their cars in a wide range of duo-tone exterior paint combinations and with a beautiful new 21” wheel. Featuring a more powerful version of Bentley’s mighty 6¾-litre twin-turbo V8 engine, the new Mulsanne Speed is truly tailored for the driver. With 537 PS (530 bhp / 395 kW), 1,100 Nm (811 lb.ft) of torque and selectable sports suspension, the Speed combines outstanding driving satisfaction with supreme comfort. The Speed dispatches the sprint to 60 mph in 4.8 seconds (0‑100 km/h in 4.9 seconds) and has a top speed of 190 mph (305 km/h) – unrivalled figures in the ultra-luxury sector. The connection between the car and driver is key, so the Speed’s engine is paired with a recalibrated ZF 8-speed gearbox designed to enhance the driving experience. The gear strategy is optimised to make best use of the increased engine output, and is designed for instant delivery. ‘S’ mode gives the driver even more control, and maintains the engine speed above 2,000 rpm so that the turbochargers are always spooled and ready to deliver instantaneous performance. To make the most of the Speed’s effortless power and acceleration, an even more driver-focused Sport suspension mode is included. While the Bentley and Comfort suspension modes provide a comfort-focused and fully compliant chassis set-up, the Sport mode stiffens the all-round air suspension for improved body control and adjusts the steering dynamics for greater feedback and accuracy. The Mulsanne Speed features a series of uniquely assertive styling features that mark it out as the high-performance pinnacle flagship. A dark tint finish is applied to the exterior brightware, affording the Speed a more menacing appearance. Exclusive 21” hand-finished ‘Speed’ alloys; dark tinted front and rear lamps; rifled sports exhausts; and Speed fender badging highlight the credentials of the world’s fastest ultra-luxury driving experience. On the inside – in addition to the interior updates common across the Mulsanne range – the Speed also benefits from a number of new features that highlight its athletic, sporting abilities. 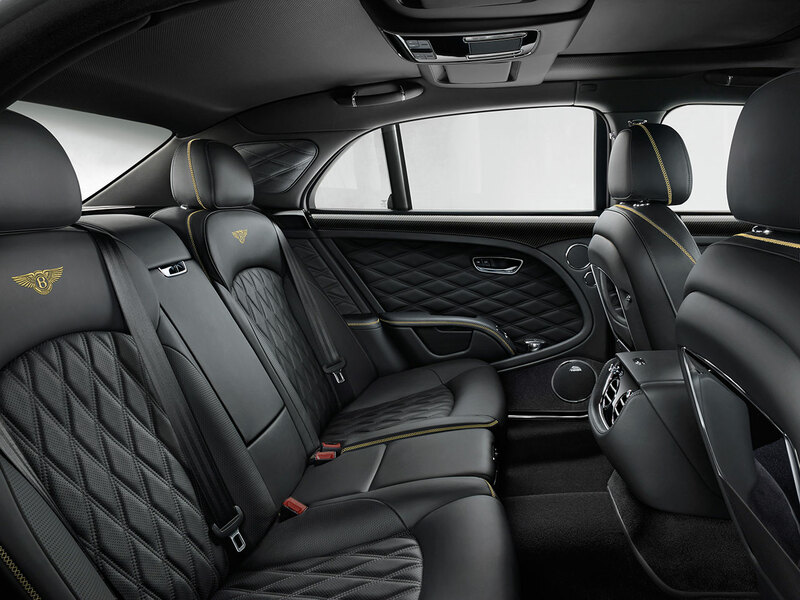 For example, the Mulliner Driving Specification interior comes as standard, adding diamond-quilted seats, a knurled gear lever, drilled alloy sport pedals and optional carbon fibre waistrail inserts. The Mulsanne is handcrafted from the ground up in Crewe, with its 400-hour production journey beginning in the Body in White workshop. Working by hand and by eye, master metal workers expertly complete 5,800 individual welds. Where the roof flows into the rear haunch through the deep D-pillar, a dedicated team brazes the joint by hand until it is totally imperceptible. It takes a human touch to achieve, and once painted is completely invisible to the eye – looking and feeling as though it were hewn from a solid piece of metal. 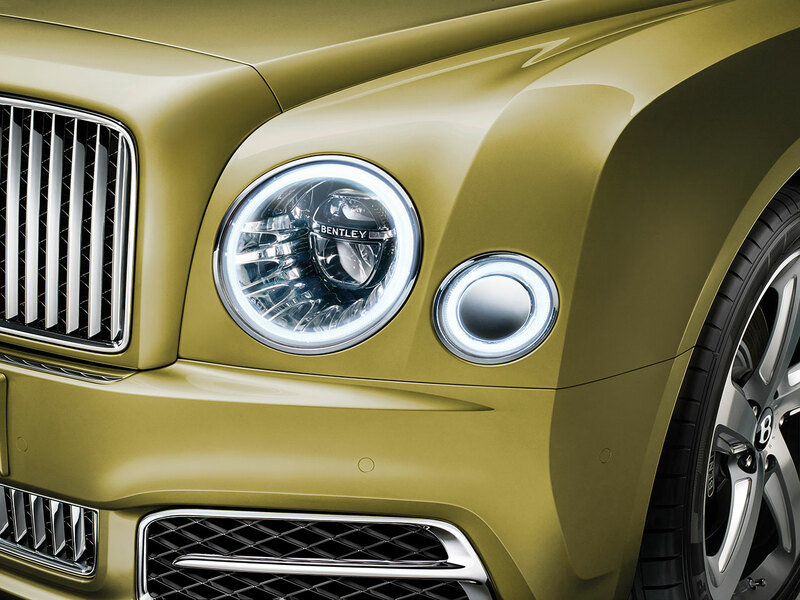 The sculpted nature of the Mulsanne’s body means that the paint must be applied in different depths to appear even, which is why each one is hand-sprayed. After lacquering, each car is fine-sanded before being polished with lamb's wool for 12 hours to achieve an appearance so reflective it's termed the ‘Bentley Mirror Finish’ – and is the industry benchmark. Opening the door of the Bentley flagship reveals a foundation of solid walnut, cherry or oak visibly running through the dashboard and overlaid with a choice of 13 different veneers. After the root burl has been steamed and finely sliced into 0.6 mm thick bundles of veneer, Bentley veneer experts travel to wherever it may be to analyse the results. The final selection process occurs at Crewe, where the veneer is chosen by the craftsperson who will ultimately bring it to life. Only the most highly ‘figured’ sections – parts with naturally decorative marks – are chosen, before being mirror matched and applied to the solid wood substrate. Of the 400 hours it takes to build a Mulsanne, around 150 are dedicated to creating the sumptuous leather interior – before additional options are considered. 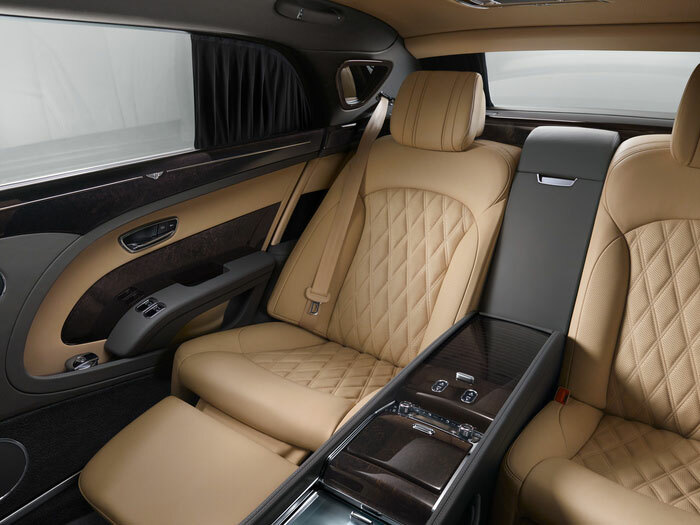 Stitched, shaped and finished entirely by hand, the completed seats, doors and other leather accoutrements rival the quality of luxury domestic furniture. The contrast stitching alone takes 37 hours to complete.